Déjà vu all over again, as Yogi Berra opined. While we posted an article similar to this one earlier today, the setup in silver is so pronounced and marks such a rare opportunity that another of the silver trade’s most respected names, Clive Maund, has published his own piece drawing attention to the same phenomenon. So it bears repeating. We may not see a better launchpad for silver for decades. 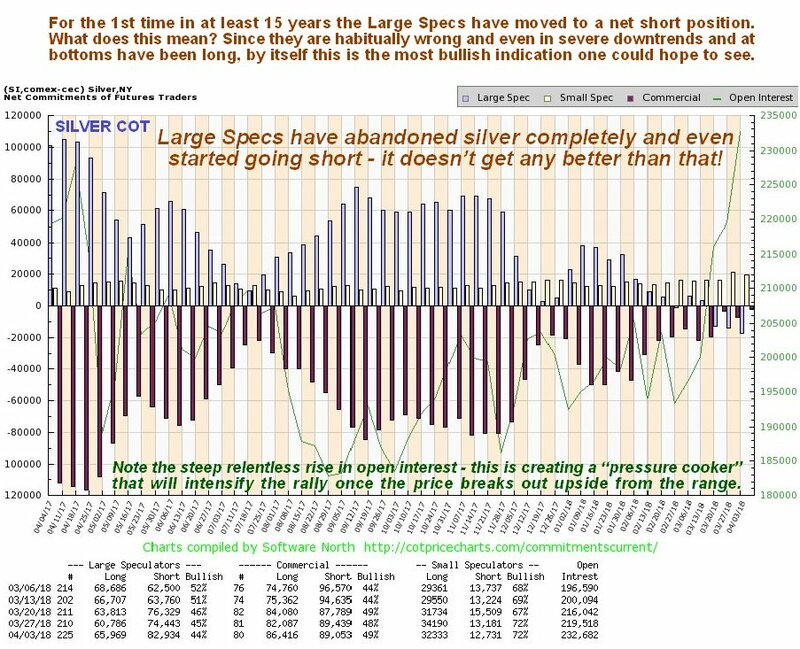 Now let’s turn to the latest COT chart, which is very interesting indeed as it provides compelling evidence that silver is getting very close to suddenly busting out upside, at which point it will likely spike dramatically as the legions of semi-conscious traders shorting it are instantly panic-stricken and race to cover. On this chart we see that after banging their heads against a wall for years by being long silver, the habitually wrong Large Specs (blue bars) have finally given up on it and in recent weeks have even had the temerity to start shorting it. This is something we have never seen before in 15-plus years of following this market and is the surest indication you could hope to see that silver is about to take off higher. Making the situation even more explosively bullish is the steep rise in open interest of recent weeks, which means that there are more traders to be caught out who will need to cover if the price starts to rise. This is an astoundingly bullish COT chart. 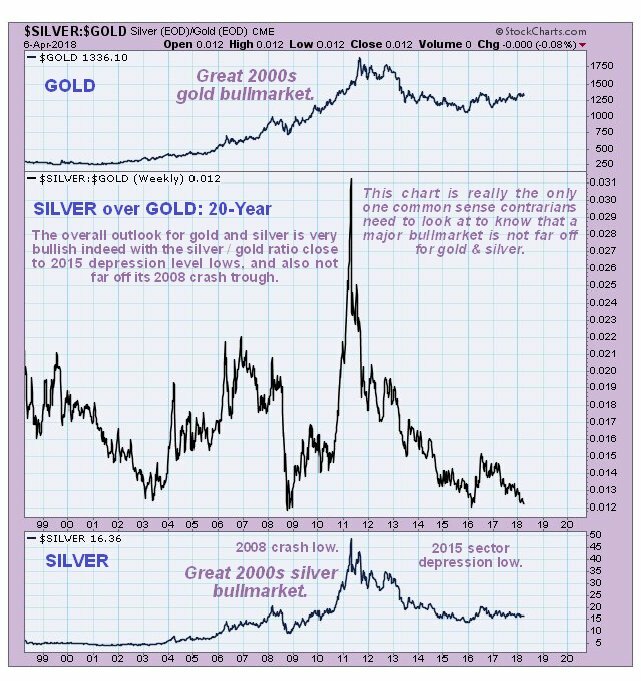 Further, there were only 3 other occasions in the past 20 years the gold/silver ratio sank to the sort of levels it is at now – back in 2003 as the sector bullmarket was just getting started, then at the lows associated with the 2008 market crash, and finally in the depths of the PM sector depression at the end of 2015 and early 2016. After the 1st two occasions of these low readings, silver entered into a major uptrend that took it much higher, and on the 3rd occasion early in 2016 a significant rally followed.